Pat: Okay, I admit it. I have a fascination with the pineal gland. That mysterious, little almond-sized or rice-sized gland (it’s been described of various sizes) that sits between the two hemispheres of the brain, surrounded but not part of the brain. Its color is reddish-gray, and it’s shape resembles that of a pine cone. Associated with the “third eye” or “inner eye” or “all-seeing eye” of occultists, and melatonin-producer per the physiologists, my interests — and those of author Richard Cassaro — center on the occult aspects of this extraordinary little ‘gem’ in our heads, the ‘seat of the soul’, as Descartes famously described it. I like to think of the pineal gland/inner eye as a ‘stargate’ to higher consciousness . . . and perhaps that is why occultists and cabal/illuminati alike were fascinated with. 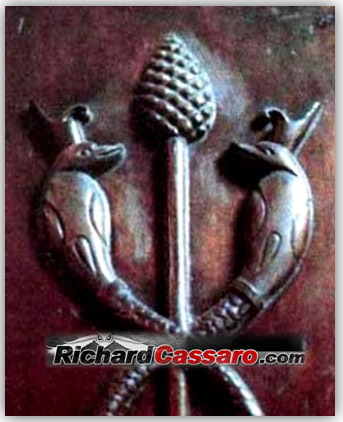 But that is for another article, as the focus of Cassaro’s wonderful and informative treatment here focuses on the symbolism of the pineal gland / pine cone image in architecture and art. This article was originally published in December 201o. Enjoy! The pine cone symbol is one of the most mysterious emblems found in ancient and modern art and architecture. Few scholars realize it, but the pine cone alludes to the highest degree of spiritual illumination possible. This was recognized by various ancient cultures, and the symbol can be found in the ruins of the Indonesians, Babylonians, Egyptians, Greeks, Romans, and Christians, to name a few. It also appears in the drawings of esoteric traditions like Freemasonry, Theosophy, Gnosticism, and esoteric Christianity. The pine cone held the same meaning for all: It symbolized a secret vestigial organ, the “pineal gland” or “Third Eye”, that we all possess. Left: The magnificent ruins of Angkor Wat in Cambodia, one of the most magical and spiritual places on earth, are filled with pine cone symbolism. Right: Antithetical animals flank an enlightened bodhisattva at Angkor Wat. The question, however, is the significance of the pine cones: it seems unlikely such a distinctive feature would appear with no rhyme or reason. What is the significance of these pine cones to Angkor’s ancient buildings? Also never explained is another Angkor Wat phenomenon called “antithetic animals.” In the example shown in the image above we see a pair of twin, symmetrical elephants facing each other, an image that is often glossed over or unexplained. Interestingly, similar antithetical animal art appears on other famous ancient archaeological “pine cone” relics. For example, at the ancient Roman pigna (Italian for pine cone) sculpture shown below, a massive bronze pine cone is flanked by twin antithetical peacocks. Above: Built by the Romans, this 1st century Roman bronze sculpture, called the “Pigna” (“pine cone”), was once an ancient fountain. 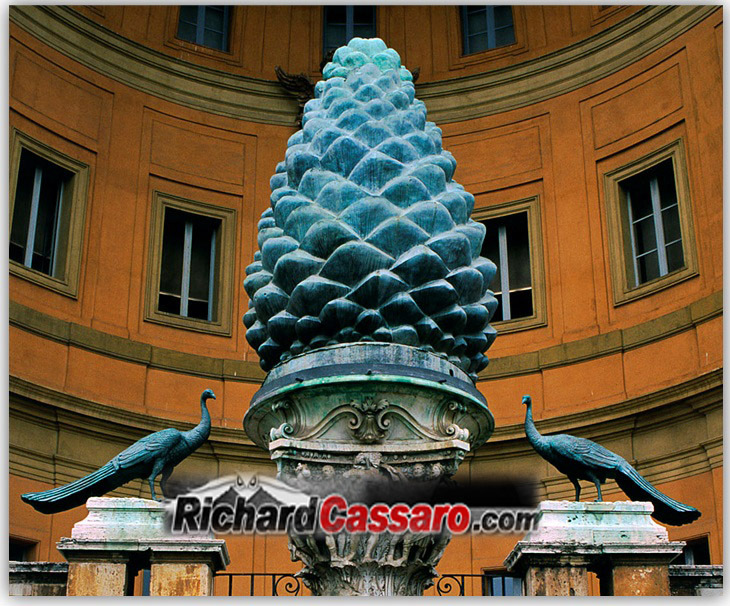 The Pigna sculpture sits in a Vatican courtyard called the Court of the Pine Cone, and is today considered the largest pine cone statue in the world. 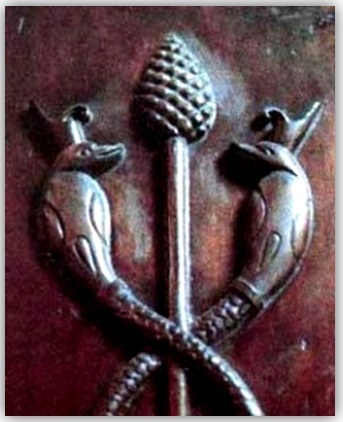 Above: The pine cone staff of Osiris. Egyptian Museum in Turin, Italy, 1224 BC. What is the symbolic meaning of these pine cones, and how do the antithetical animals factor into their overall meaning? What is the deeper secret these apparently inscrutable images hide? The answer to this is that pine cones, throughout history, have symbolized the “pineal gland”, or “Third Eye”, and by association the esoteric act of awakening it. 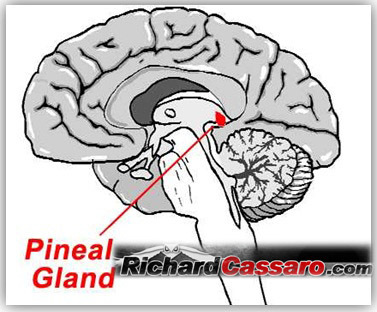 This gland is said to lie at the geometric center of the brain, and considered by some as the biological Third Eye; the French philosopher Descartes famously referred to the pineal gland as the Seat of the Soul. Above: The pineal gland is shaped like a tiny pine cone, hence its name. The pine cone symbolism is not lost on ancient cultures; in India, Hindu tradition teaches followers to awaken the Third Eye by activating their “seven chakras”. It is an ancient exercise, still practiced today, called Kundalini Yoga; it is claimed to directly affect human consciousness, develop intuition, increase self-knowledge, and unleash one’s creative potential. Interestingly, the esoteric symbol of kundalini yoga is the caduceus- a symbol that features two antithetical serpents. 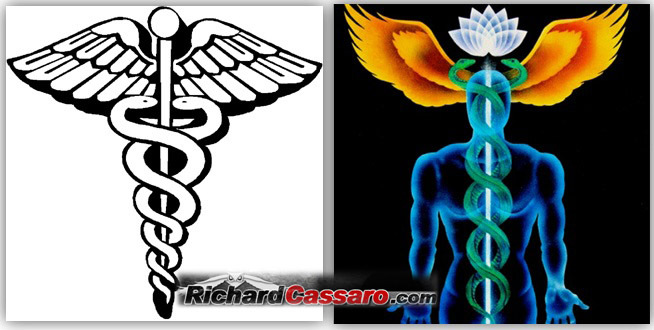 Left: The caduceus staff, carried by Hermes in Greek mythology. In ancient Rome it was depicted in the left hand of Mercury. Right: A visual representation of the practice of Kundalini yoga, the ultimate goal of which is to awaken the Third Eye hidden in the human forehead. Kundalini is the spiritual energy or life force present in every human being, located at the base of the spine. To awaken the Third Eye, the kundalini energy must be summoned to the forehead, where it expands and thus awakens the Third Eye. The energy is said to travel along the ida (left) and pingala (right), up the central pole or sushumna. This is the process esoterically depicted by the caduceus symbol of two antithetical snakes spiraling up a central staff. Thus, antithetical animal art associated with the pine cone—twin elephants in Indonesia, twin peacocks in Rome, twin serpents in Egypt—is really an allusion to the ida and pingala channels (the antithetical twin serpents on the caduceus). The central sushumna is, in turn, symbolized by the third, centered drawing (often a pine cone) which on the caduceus is the main rod running north south. Many ancient cultures incorporated images of the pine cone into their spiritual art and architecture, and they all also created antithetical animal art. Pagan gods of Babylon, Egypt, Mexico and Greece were associated with the pine cone, and the staffs of these gods were often adorned with the pine cone. Left: Sumerian God Marduk with pine cone in hand. Right: Dionysus, the Romans Bacchus, carried a “Thyrsus” topped with a pine cone. Left: Bronze pine cone symbol in Aachen cathedral in Aachen, Germany. Middle: Roman pine cone statue in the Piazza Venezia, Italy. Right: Ripening pine cones. Readers familiar with Eastern religions will recall the Third Eye as having a long history in India, China, and Southeast Asia, where the religious traditions of Hinduism, Buddhism and Taoism hold sway. More than a “religious” idea, the Third Eye is an archaic “spiritual” custom that transcends religions. It is known variously as “urna” and “trinetra,” and often marked by a dot in the middle of the forehead between the two eyes. 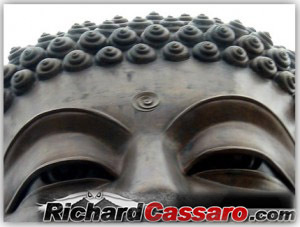 Above: The Third Eye between the eyebrows of the Buddha. Awakening his Third Eye permitted the Buddha to understand the forces of existence and their manifestation in the chain of causality. 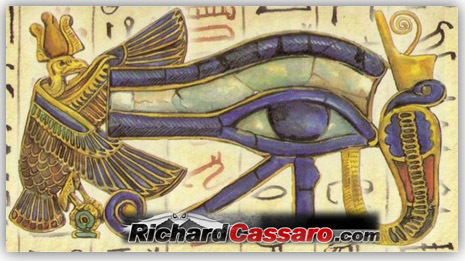 The Eye of Ra, a disembodied Eye signifying the Third Eye of illumination. The Third Eye was commonly described by ancient mystics who experienced the divine light. The question, however, is why the West has been so ill-informed of this Third Eye and its unlocking even as the Eastern traditions have incorporated them into their practices. The answer to that is the rise of Christianity in the west; the practice and idea of an “inner god” or “Third Eye” to awaken runs afoul of traditional Christian teachings. These wisdoms, forced underground, became the origins for secret societies that passed on these esoteric wisdom; one of these societies was the Freemasons. It comes as no surprise, then, that pine cones appear regularly throughout Masonic decoration. 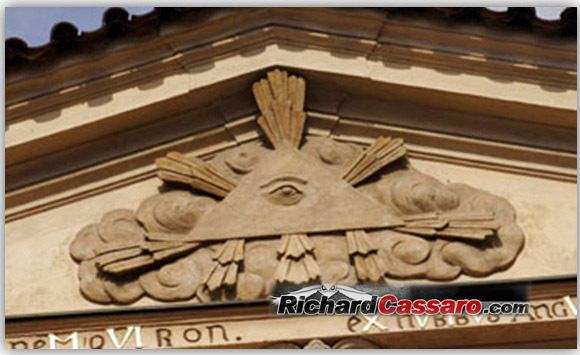 They are depicted in Masonic art, they hang from the ceilings of Masonic Lodges, and they are etched in stone on Masonic-constructed buildings throughout the world. A large Masonic design on the side of the Whitehall Building in the New York Financial District depicts two enormous intertwining snakes spiraling up to a pinecone (which is striking similar to the Staff of Osiris). Left: A caduceus depicting a pine cone appears on the Whitehall Building in New York City. The Third Eye has been hidden in plain sight in the West, masked as the term “all seeing eye” and superficially said to be the eye of the Jewish deity. For this reason, Masons refer to it as the “all-seeing eye of God”, when in reality it’s the awakened Third Eye. Masonic Lodge, Prague 18th Century, depicting a Third Eye inside a luminous triangle. The term “all-seeing eye” in and of itself is indeed correct; but it’s not the all-seeing-eye of the Hebrew God; it is the all-seeing eye of you, the pineal gland that we all have. Many highly trained and educated Masons who lived during the 20th century, including several noted authors and scholars, were convinced that the all-seeing Eye was not the Eye of the Bible’s God, and that the modern system of Freemasonry we’ve inherited, based on the Hebrew Bible, is in fact corrupted. 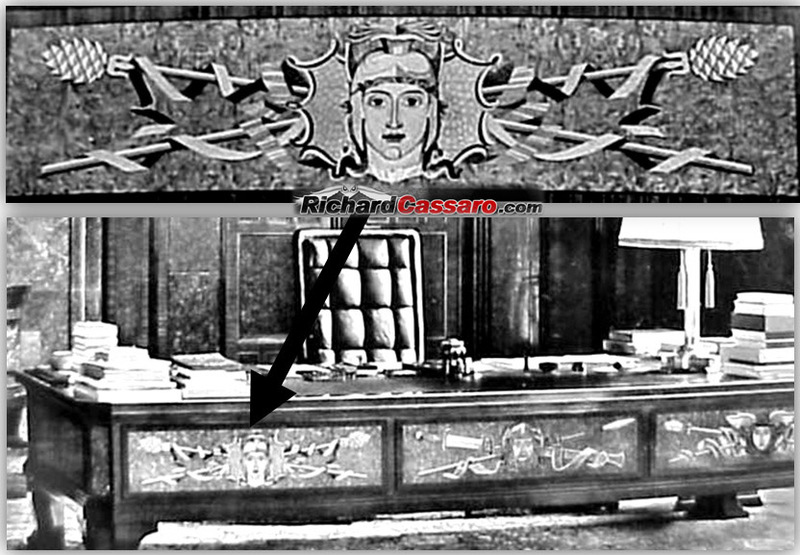 Picture of Hitler’s desk. See the Left panel. A deity is flanked by staffs at the end of which are a pine cone. It seems that, almost 100 years ago, Hitler knew things about the Third Eye that most Americans are only now starting to rediscover. Left: The Third Eye in the triangle is visible above the French Declaration of Human Rights. The Third Eye in the triangle above a truncated pyramid on the reverse of the Great Seal of the United States. Is it possible, then, that the pineal gland has been overlooked in Western society intentionally, so as to rob the masses of its power? Is it possible that the Third Eye is the lost secret of authentic Freemasonry, lost at some point in the mid 1800s? The pine cone symbol, then, alludes to the Third Eye: it abounds in ancient art and architecture, a symbolic representation of our now-dormant window to the world. While knowledge of the Third Eye and the practice of awakening the Third Eye continued strong in the East, it began to die in the West at the start of Christianity. Consequently, Secret Societies like the Freemasons were established to protect Third Eye knowledge, initiate new members into its wisdom, and keep the practice alive. This explains why the image of a single Eye is common to Western Secret Societies, whose constituents possessed exceptionally philosophical, active, creative, and spiritual minds. A single Eye is one of the supreme and sacred emblems in Freemasonry. The Third Eye seems strange, even downright alien to us in the West, even today, despite our living in the “information age” of globalization. The fact that the Third Eye is so unknown, so strange and so alien to our way of thinking is something of an enigma. The reason is because there seems to have always been, and there continues to be, a conscious effort to conceal it by a powerful elite who don’t want the masses to discover its secrets. This entry was posted in Awakening, Healing, Science and Space, Spirit, Waking Up and tagged awakening, opening third eye, pine cone, pineal glad as stargate, pineal gland, pineal gland and architecture, pineal gland and illuminati, third eye, waking up. Bookmark the permalink.